I considered mutually contradictory). All normal. and he’d walk across to take care of it. they’d read a magazine, an old Punch or a recent People. to each other about prices and lines and these days. he’d tell me to adjust the billing for the longer time. set up in its tracks on the table. You put it together? go around the station. My father could never figure it out. “Can I try?” and he fixed it in 5 seconds. And then he talked. he’s doesn’t shrink heads. He expands them. 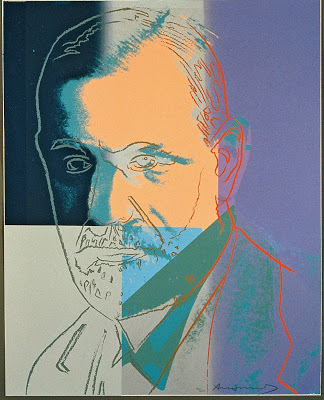 IMAGE: Portrait of Sigmund Freud by Andy Warhol (1980). NOTE FROM THE AUTHOR: My father is now retired, but at the time I worked for him, he was the only psychiatrist in Western Massachusetts. Even now I meet doctors who recognize my name because they’ve read his notes in their patient files, and I wonder if those were notes I typed up. ABOUT THE AUTHOR: Janet Bowdan‘s poems have appeared in APR, Crazyhorse, Verse, Denver Quarterly, Pinch, Free State Review, Peacock Journal, Best American Poetry 2000, Poetry Daily, and elsewhere. The editor of Common Ground Review, she teaches at Western New England University and lives in Northampton, Massachusetts, with her husband, son, and sometimes a lovely stepdaughter or two. Sam Silvas, author of the short story collection Stanton, California, will appear along with more than 100 authors at LitFest Pasadena, which will take place in Pasadena, California, on May 20 & 21, 2017. For a complete schedule of authors and events, visit litfestpasadena.org. Extra spearmint like you used to chew. before one puff wasn’t enough. of green on your white pillowcase. lying there all day long, dying. it’s Extra spearmint chewing gum. I chew it in memory of you. SOURCE: “What I Found” is featured in the author’s chapbook Hello, it’s Your Mother (Finishing Line Press, 2015) and in Mused: The BellaOnline Literary Review. ABOUT THE AUTHOR: Laurie Kolp, author of Upon the Blue Couch and Hello, It’s Your Mother, has poems in Rust + Moth, Bracken, concis, Prelude, Crack the Spine, and more. She lives in Texas with her husband, three children, and two dogs. Learn more at lauriekolp.com. PHOTO: The author during a beach trip, 2014. We asked the 97 contributors to the Nancy Drew Anthology (Silver Birch Press, October 2016) to send photos featuring the book in their home environments for a series we’re calling “Nancy Drew Around the World.” Author Jennifer Hernandez sent this photo of herself and the book in front of the giant walleye at Lake Mille Lacs on a road trip home from the League of Minnesota Poets fall conference. As she tells us, it doesn’t get a whole lot more Minnesotan than this! Jennifer contributed the poem, “Nancy Drew is my kind of princess,” featured below, to the collection. ABOUT THE AUTHOR: Jennifer Hernandez teaches and writes in the Minneapolis area. Her work has appeared recently in Mothers Always Write, Rose Red Review, Silver Birch Press, and anthologized in Bird Float, Tree Song (Silverton Books). She has performed her poetry at a nonprofit garage, a bike shop filled with taxidermy, and in the kitchen for her children, who are probably her toughest audience. This accomplishment, of their love, shone through. My hat had won the show, yes, this was, cool. “Oddest-thing-is” I don’t recall wearing it. & joy in their proud hearts, still so, enthral. Describing how they saved their silver foil. Buy more packs, hadn’t they heard of Tinfoil. IMAGE: The authors homemade top hat. ABOUT THE AUTHOR: Mark Andrew Heathcote’s debut book, In Perpetuity, published in 2016, is available from CTU Publishing. His work recently appeared at THE BEZine and in the Silver Birch Press “When I Moved” Poetry & Prose Series. purchased in a southwestern shop miles from my seaside setting. style too out of touch for my nautically themed town. explain my long ago attraction to a flashy–red–western hat. beautifully bodacious cowboy hat for me. NOTE FROM THE AUTHOR: It was clear that I needed to write about my neglected red cowboy hat. And I knew my uncle’s being inducted into the North Dakota Cowboy Hall of Fame would be key to this poem, but I did not realize that writing about Me, in a Hat, would lead to such a direct connection with my uncle, or put me so in touch with my heritage. ABOUT THE AUTHOR: Alice Morris is a Minnesota native with a BS in English Education from Towson State University and an MS in counseling from Johns Hopkins. She comes to writing with a background in art — published in The New York Art Review and a West Virginia textbook. Her poetry is included or forthcoming in several themed collections and anthologies, a shared chapbook, The Broadkill Review, Silver Birch Press, The Avocet, The Weekly Avocet, and Delaware Beach Life. Morris is an active member of Coastal Writers and the Rehoboth Beach Writers Guild. to the cold tiled shop floor. Every summer this is my hat. NOTE FROM THE AUTHOR: I have lots of hats, but only one I tend to wear. I took it on a recent photo shoot, so I knew I could supply a photo of it. When it came to writing, I remembered where it was bought and spent some time with memories I had archived. There is, as always poetic truth included in transaction. All good poetry has some depth. I tend to free write and then go back to clip and edit my poetry; this one flowed fairly naturally and has just been quietly moulded. ABOUT THE AUTHOR: Nina Lewis is widely published in poetry journals and anthologies, including Abridged, Fat Damsel Take Ten, Hark, Here Comes Everyone (HCE), I am Not a Silent Poet, New Ulster Poetry, Nutshells and Nuggets, and Under the Radar. Nina was a runner-up in a Poet Laureate competition 2015/2016 and often performs at spoken word events and literary festivals. She was commissioned to write and perform poetry on “urban nature” at the Birmingham (U.K.) Literature Festival in 2014. Nina’s work also formed part of the poetry trail for Wenlock Poetry Festival, been found in the vaults of the Municipal Bank as part of an International Dance Festival, and 21 Haiku were used for an Art Installation at the MAC. Her debut pamphlet Fragile Houses, was published by V. Press in 2016. She hosts INKSPILL, an annual writing retreat at awritersfountain.wordpress.com..